Auckland, Canterbury, Waikato, Wellington and Otago will host All Blacks Test matches in the 2012 international season, the New Zealand Rugby Union (NZRU) announced today. The Rugby World Cup winning All Blacks will play Ireland in the three-Test match Steinlager Series in Auckland, Hamilton and as announced earlier today, at a redeveloped Rugby League Park in Christchurch. The All Blacks will also play three Test matches in The Investec Rugby Championship – the exciting and ground-breaking replacement for the Investec Tri Nations Series featuring the introduction of Argentina and unveiled by SANZAR today. Wellington will host the first annual Rugby Championship Test match against the new competition entrants on 8 September, while Australia will try once again to break the jinx at Eden Park on 25 August, and South Africa will head south to Dunedin’s new Forsyth Barr Stadium on 15 September. NZRU CEO Steve Tew said both Ireland and Argentina enjoyed enthusiastic support from New Zealand fans during the recent Rugby World Cup. “Ireland really set the tournament on fire and it will be great to have them back in New Zealand next year. It is particularly special that they will play in Christchurch at the redeveloped Rugby League Park – the first Test match in Christchurch since the Canterbury earthquakes. “The Investec Rugby Championship will see the return of traditional southern hemisphere rivals South Africa and Australia who usually bring out the competitive spirit in our rugby fans. “The 2011 Rugby World Cup demonstrated exactly how exciting matches between these four countries can be, and how fans bring much of the colour and atmosphere to a venue,” Steve Tew said. “Outside of the Rugby World Cup, the Pumas last played in New Zealand in June 2004. As we saw during the tournament, their colourful and lively fans will be sure to add something special to The Investec Rugby Championship. “This Championship will ensure fans get to see more of the outstanding, hard-hitting and exciting rugby for which our SANZAR nations are known as well as the flair and unpredictable style of rugby that Argentina is sure to bring,” Tew said. 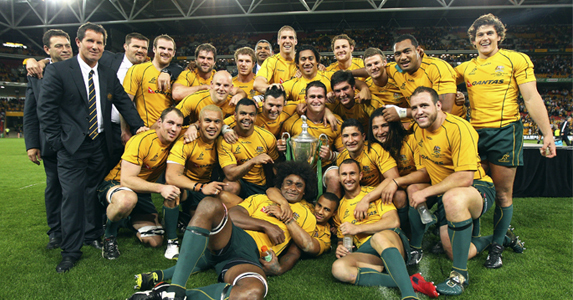 – August 18 – Wallabies v All Blacks in ANZ Stadium, Sydney, and South Africa v Argentina in South Africa. – August 25 – All Blacks v Wallabies at Eden Park, Auckland, and Argentina v South Africa in Argentina. – September 1 – Travel bye. – September 8 – Wallabies v South Africa in Perth, and All Blacks v Argentina in Westpac Stadium, Wellington. – September 15 – Wallabies v Argentina at Skilled Stadium on the Gold Coast, and All Blacks v South Africa in Forsyth Barr Stadium, Dunedin. – September 22 – Travel bye. – September 29 – South Africa v Wallabies in South Africa, and Argentina v All Blacks in Argentina. – October 6 – Argentina v Wallabies in Argentina, and South Africa v All Blacks in South Africa.